Japan's highest elevated three-storied pagoda. 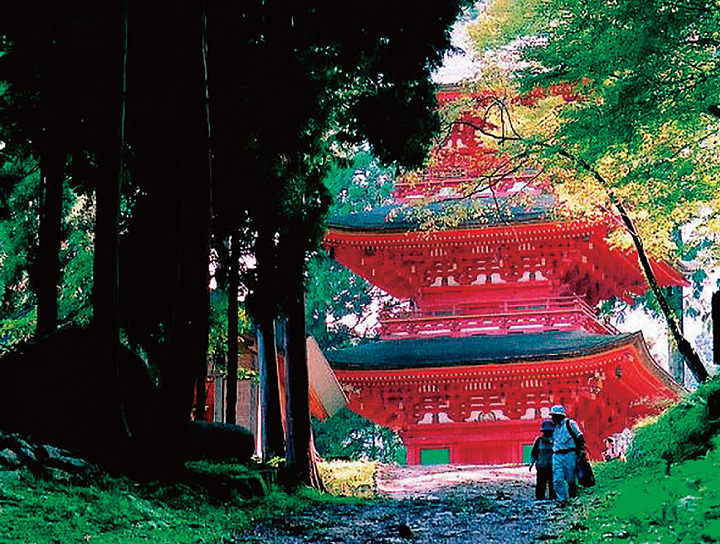 Nagusa Jinjya Shrine is a shrine that is situated halfway up Mount Myōken (Myoukensan), and that enshrines the god of marriage and a bountiful crop. Surrounding the shrine are several large 200 year old Japanese cedar trees are lined up which create a mystical atmosphere. The worship (haiden) hall becomes the central passageway for the shrine, which is exceedingly rare. In the main hall of the shrine (honden) you can see several elaborately carved, stone lion statues. Each lion is depicted with a unique facial expression and action. Under the eve of the roof of the three-storied pagoda (sanjyūnotō) are four statues of monkeys each in a different pose : one that can't see, one that can't talk, one that can't hear, and one that can't think. 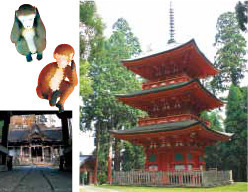 These four monkey statues, called shien in Japanesecan, are valuable artifacts that can only be seen at Nagusa Jinjya Shrine. 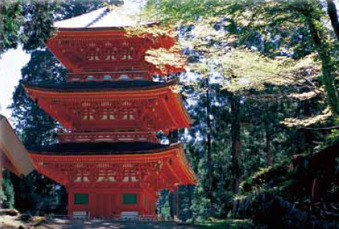 Furthermore, the three buildings that make up the shrine (haiden, honden, sanjyūnotō) are designated as a national important cultural property.